My mom's friend: "Mackenzie, are you SO excited for Christmas?! Santa is going to bring you lots of presents but only if you have been a good little girl so you need to listen to your Mommy and Daddy ok?" Mackenzie (in her most serious adult tone): "Santa's pretend." My mom's friend (shocked): "Well...ok. Good for you!" let me explain how Mackenzie came to that conclusion. During the beginning of December we bought Mackenzie and Wesley this Veggie Tale movie. 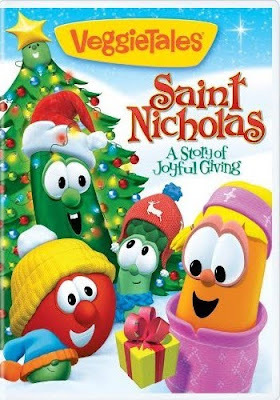 The movie tells the real story (or at least the Veggie Tale version) of Saint Nicholas. Both kids loved it and watched it multiple times a day for the entire month. Mackenzie especially, was super into it and would ask me all kinds of questions about it. So when she asked we would tell her that Santa is pretend but he's based on Saint Nicholas who was a real person who loved Jesus and gave gifts to people. We would also tell her that we give gifts at Christmas because Jesus gave us the very best gift of all (as well as a bunch of other things that explain the true meaning of Christmas)! It was just so funny to me that she actually told the lady that because most of the time it seems like what I say goes in one ear and out the other. Hopefully she got more then the Santa's-not-real part of Christmas but I guess for now that's a start. does it make you a little sad that she doesn't believe in santa anymore? 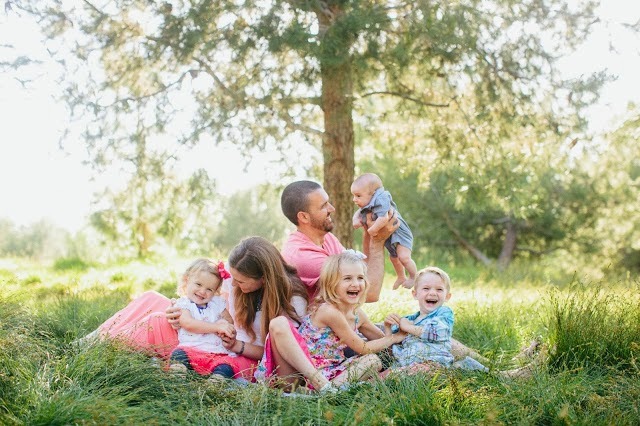 I love that story - I've been thinking about how to approach the whole santa thing b/c I just had my first baby in August and I know all too soon he'll be talking about Santa and presents at Christmastime. I don't want presents to be the main focus of Christmas even when he's little. I guess finding ways to focus on the real meaning of Christams is a good solution. That's exactly what I'm telling mine when he's old enough to understand he was only 3 months this year so he wasn't too concerned =] I think its great way to avoid total devastation and keep your kids focused on others rather then just being greedy. I was so heart broken I still remember feeling so betrayed by my parents I even questioned my religion a very extreme not typical reaction to finding it out, but I'd rather just avoid that entirely! To be honest I was used to be really sad at the idea of my kids not believing in Santa because I had so much fun believing in him when I was little, but now that I saw it was no big deal for Mackenzie I feel way better about it. She still gets really excited to see Santa at the mall, etc. and we can still leave out cookies for him (although we didn't this year) and do the other fun Santa things at Christmas time but she just knows that he is pretend. She pretends plays all the time so to her it's no different and no less fun. What Runaway Mommy said is my greatest fear...that if I pretend Santa is real she will be devastated when she finds out and question everything else I have been teaching her and telling her is true (like Jesus and the Bible!). Plus I think staying away from the huge Santa hype makes it easier to keep Christmas about Jesus! But I love how with the real story of Saint Nicholas we can incorporate both! It's kind of the best of both worlds. Anyways, I know it's different for everyone...this is just my view for now. That's exactly what we've always told our kids. We've always bought into the argument that we don't want to tell them that both Santa and Jesus are real and then one day they have to decide why one is real and one isn't. I also never wanted to get into all the lies that it takes to make a child believe in Santa (why does one child get better gifts? 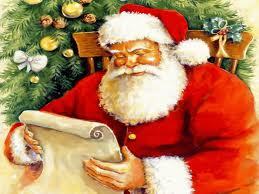 why does Santa go through the door at someone else's house and how does he do that?). We still visit Santa and do lots of fun things but to our kids he's just a fun character.